It has been passed down my Almeroth line, that "They were sugar loaf makers from Saxony!" When I traced them back, I came to a halt at HERMAN ALMEROTH..... he was married at St Dunstan's Church, Stepney, Mdx, in 1793. He and his wife, Sarah, had 8 children; the first was baptised at the Sion Chapel , the others at St Mary Whitechapel (see right) and St Dunstan Stepney, but only 3 survived into adulthood. 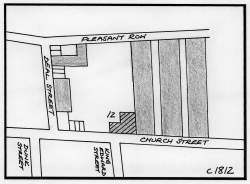 Their addresses in the early years included Half Moon Alley , Whitechapel High St , and Duncan St , all in Whitechapel. It was not until I found Herman's will that I proved he had indeed been a sugar refiner. 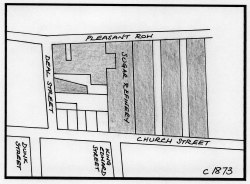 "I, Herman Almeroth of Church Street in the Hamlet of Mile End New Town in the County of Middlesex, sugar refiner......" He died, a wealthy man, and was buried on 14 May 1812 at St Dunstan Stepney, age 50. 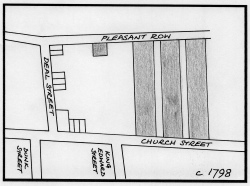 The Land Tax Records show that Herman took over the sugarhouse from Blankenhagen & Co, paying his taxes from 1806 through to 1812. Directories of 1809, 1810 & 1811 show H. Almeroth & Co in Church St, MENT, and the MENT Rate Book of 1812 also. Other directories show the refinery at 12 Church Street still bearing that name in 1813 & 1814, but by 1814 it was in the hands of Burnell & Co, and then Burnell & Geis. The premises were severely damaged by fire in 1821, but re-established as a much larger concern in years to come. 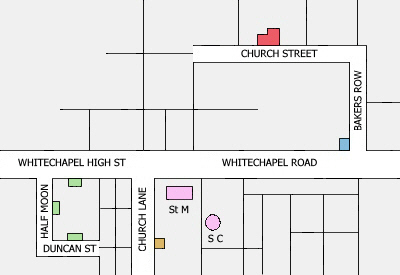 Of Herman's children... Henry ran a grocer's shop at 93 Whitechapel Rd from 1819, though is shown as a clerk at the Court of Requests in Osborn St on his death certificate in 1838; James, ran a bakery at 12 Church Lane from the early 1820's, though he was bankrupt by 1834, and died a very poor biscuit-baker in 1837; and Alice married James Dunch, a surveyor. All 3 children and their mother Sarah, now remarried to James Hay, benefited from the will of Henry Mum, sugar refiner in 1828. Although Herman may have had 2 brothers, for there was a George and a Daniel both married in London at a similar time, it would appear that all but a few of the UK Almeroths descended from him. As to their German origin... well, I am little closer than I was at the beginning. Herman's occupation led me to believe that Saxony may have been Lower Saxony, but both the IGI and the current telephone books place the majority of what few Almeroth entries there are in Hessen and Thuringen. The only real location I have is that of Rinteln where a Sophia Louisa, daughter of Joseph, is said to have been born; she married in London in 1854, but I cannot find a connection with my family yet. Three Almeroths from Hersfeld emigrated to USA in 1770-80s; again no connection yet. If Herman was known to Henry Mum before he arrived in London, there may be a connection in Schwabendorf, Hessen, where the Mum family came from ... an Almeroth lived there too, but again nothing further. 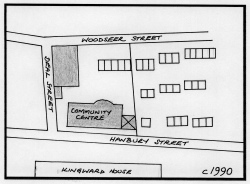 From the series of maps, we can pin-pointed the site of the sugarhouse in Church St, now Hanbury St, to the right-hand side of the photograph ... where the arch is. 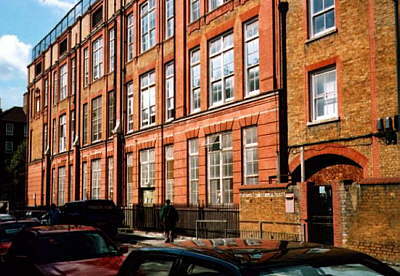 The present building is a education and training centre, though it was originally built as Deal Street School in 1895.